Why sell with Brock Taylor? LOCATION An impressive four bedroom detached family home set in an ultra convenient location within a short walk of Horsham mainline station with its fast service to London Victoria (under 1 hour). The property is also ideally situated for swift access to Horsham town centre with its wealth of shops and restaurants, together with the picturesque Horsham Park and Pavilions leisure centre and pool. The property is within the catchment of a number of the town’s most popular schools, which includes Heron Way primary, Forest Boys and Millais Girls secondary schools. There is also good access to all main roads including the A24, A281, A264, A29 and M23 together with Gatwick International Airport. PROPERTY The front door opens into a generous Hall, which has stairs leading to the First Floor and doors opening to the Dining Room, Living Room and Cloakroom. The Living Area is a fantastic, double aspect space measuring 17’11 x 15’0, offering the ideal space to relax at the end of a long day with a door opening to the beautiful Rear Garden and double doors opening to the Dining Room. This is open plan to the Kitchen and boasts maximum measurements of 28’1 x 14’11, providing the perfect area to entertain friends and family. The Kitchen Area has a range of appliances, a breakfast bar, wine/broom cupboard and views over the front garden, which offers a generous amount of parking. Completing the ground floor layout is the Conservatory, with double doors spilling out to the Rear Garden, Shower Room and Utility Room with access to the Garage. To the First Floor is a Family Bathroom and four fantastic Bedrooms with the largest two being double aspect and providing plenty of space for wardrobes. 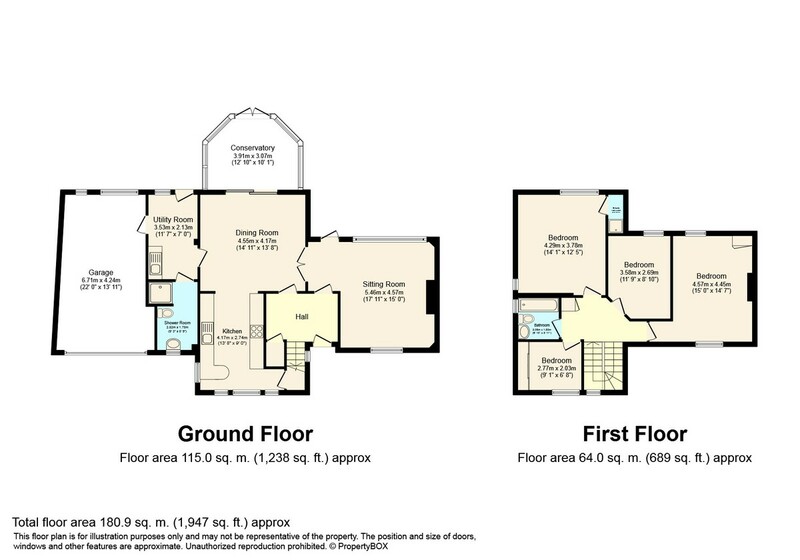 This property also offers excellent potential (stpp) to extend above the Garage, adding additional Bedrooms. OUTSIDE This fantastic family home is set back from the road, with a large shingle driveway, surrounded by mature borders, providing off street parking for a number of cars. This leads to the Garage, which measures 13’11 x 22’0, has an up & over door, power & lighting, and offers excellent potential to be converted into additional living space (stpp). Side access takes you through to the generous, South Facing Rear Garden, which has a paved patio, perfect for barbecues in the summer months, leading on to an expanse of lawn with well kept borders and garden shed. This offers the perfect space for the children to play, or for keen gardeners to make the most of.